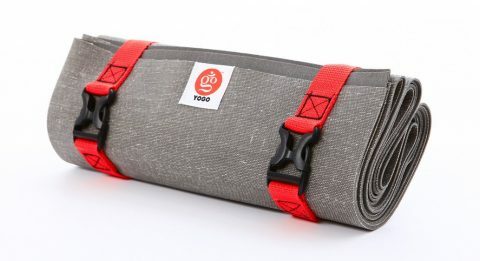 The YOGO eco origami yoga mat 2.0 version now comes with a handle! It folds up to a super-portable size and its attached straps form a handle and can also be used to hang and dry the mat. It’s made of durable natural rubber, with a cotton mesh inside that keeps it from stretching. It stays clean because the bottom doesn’t roll onto the top. And, YOGO now gives one Food Tree per mat plus sustainable agriculture training to poor families in developing countries. Plus, you can buy a tree for $1 in their store. Just like that you can add a tree to your cart during check out. Love this. Bummer that the grey one is already sold out. I’m sorry….$68 for something I sit on in the dirt and swear all over? This company teaches people something our civilization has been mastering for thousands of year…farming. How about we stop helping other countries when we have homelessness and hunger concerns in our own country? Oh, I know. Because helping poor people in other countries is better PR and moves product faster. Gotcha. I don’t care how amazing a product this might be – when you attach yourself to a cause with a for-profit company, you start blurring the line between how much YOU care vs. how much you just want to APPEAR to care. No surprise – no response from Jessica. @Jim, thanks for your comments and concerns. Regarding the price, you are right it is definitely possible to buy a very inexpensive yoga mat. Typically however these are made of PVC or some other type of non-biodegradable plastic and they don’t last very long. That cheapness is possible due to imposing pollution costs on the environment. At YOGO we have striven to produce only sustainable products. Our yoga mat is made with biodegradable natural tree rubber that is durable and will last a long time. This is more expensive to make and it reduces the possible number of buyers to persons willing to pay for high quality, but it’s worth it to us to be able to present a premium product that is also ethically sustainable in terms of humans and the environment. Yoga mats might be something seemingly base, that you ‘sweat all over’ but they are also a site of personal transformation, and the foundation for your practice, and we believe the most important piece of yoga gear. Furthermore most premium mats that are sustainable cost over $100, so we are happy to present a more affordable, minimal and transport-able solution. @Jim You can also purchase a tree for $1 all by itself! No need to buy a yoga mat. This is a feature we have not seen anywhere else and we’re very pleased to offer it and notice that over half of buyers choose to not just support a premium sustainable product that includes a tree, but go above and beyond to “add a tree” to their cart! This is an amazing testament to our customers’ commitment to making a difference with humans and the environment.